Cal Poly has received permission from the CSU Chancellor's Office to offer blended programs that under certain circumstances award a bachelor's degree and a master's degree at the same time. in most cases, to allow for the possibility of students' earning graduate credit for several of their senior electives, effectively decreasing the summed unit requirements for both degrees. To enable a senior project capstone experience to be integrated with a graduate thesis/project. Individual programs determine the criteria for admission. Upon acceptance into a program, the Graduate Coordinator notifies the Graduate Education Office of this decision and an evaluation of the student's undergraduate status is recommended. Students who have exceeded the maximum number of units allowable (see below) cannot pursue the Blended degree objective. Admission to a Blended program does not constitute recognition of Blended (graduate status) by the Office of Academic Records. Students are considered to be formally pursuing the Blended Degree Objective when they change their status from undergraduate to graduate by filling a Post Baccalaureate Change of Objective. The student must successfully complete a minimum of 180 units / maximum 205 units. These units must count toward the undergraduate degree as defined by Registrar as degree applicable units. The student cannot enter a Blended program if maximum number of units exceeded (as defined in #1). Students must be matriculated at graduate status for 2 quarters before they can graduate. Minimum 2.5 GPA in the last 90 quarter units attempted. Note that students, once admitted to graduate standing, must maintain an overall 3.0 GPA or better in courses that appear on the Formal Study Plan. Prior completion of the Graduation Writing Requirement is required before a student can transition to graduate status. The student makes a request to department/graduate coordinator for change of degree objective to Blended. A working graduate study plan is prepared and submitted to Graduate Programs Office before 12 graduate units have been completed. Department chair or graduate coordinator, with the assistance of Evaluations, determines whether student meets eligibility criteria (see above). If criteria are met, coordinator sends Change of Objective form and Admission to Blended Programs Approval Form to the Graduate Education Office. The student must be matriculated for at least two academic quarters in a graduate status. Change in status will take effect the quarter following the one in which the request is received by the Records Office. Blended Students CANNOT file Leaves of Absence or leave for a Co-op during the first quarter they have reached graduate standing. Cal Poly's system will not allow it. 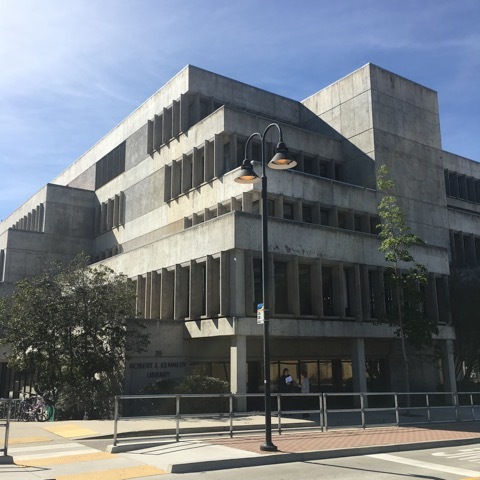 If the student does not enroll in regular coursework during their first quarter at graduate standing, Cal Poly's system discontinues them as "no-shows". The student must have a Formal Study Plan submitted to and approved by the Graduate Programs Office (only for courses counting toward MS); have been "Advanced to Candidacy"; and have a minimum overall 3.0 GPA in courses counting toward the MS. The student applies to graduate in the Blended program (BS & MS) by submitting a Request for Graduation Evaluation to the Office of Academic Records when all requirements in have been completed. This request should be submitted at least one quarter prior to graduation. When all requirements have been met for both degrees, Records re-opens undergraduate matriculation (secondary), posts the undergraduate degree, then completes graduate matriculation (primary). Both degrees are awarded at the same time at a commencement ceremony. If a student fails to complete MS requirements, but completes undergraduate degree requirements, the undergraduate matriculation can be re-opened in order to grant the BS degree. The student must file a Postbac. Change of Objective with the Graduate Education Office indicating that the new objective will be the bachelor's only.